The main motivation for writing this post is to give credit to those games that have been a source of inspiration for creating Dash till Puff! Also, it gives an idea of how a game takes shape, hot it evolves and changes, how ideas are introduced and the motivation behind them. More or less a year ago Flappy Bird was still the thing. I personally loved Flappy Bird as a user and independently of the small envy we all mobile game developers felt for such a simple game becoming such a hit (the “I could’ve made it syndrome”), in my opinion, Flappy Bird was a very fun little game. 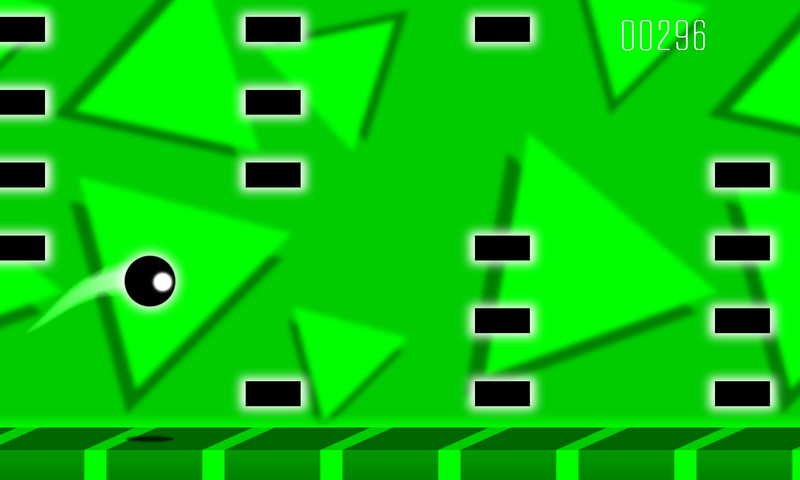 I decided, for fun, to take Rock Ninja and make a Flappy Bird style simple prototype with it. Instead of pipes there were bouncing rocks and instead of the bird there was a ninja. The more interesting thing about this first prototype, though, was that the game was endless and procedurally generated, always ensuring there was a valid path. The implementation had potential. 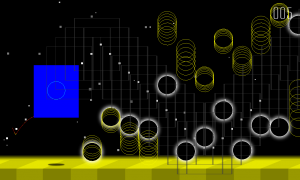 The obstacle creation was independent from the type of controls and main character motion meaning I could change how the main character moved and the level would be generated accordingly. It was then when I thought it would be fun to have different worlds, each of them with a different control scheme and different obstacles. 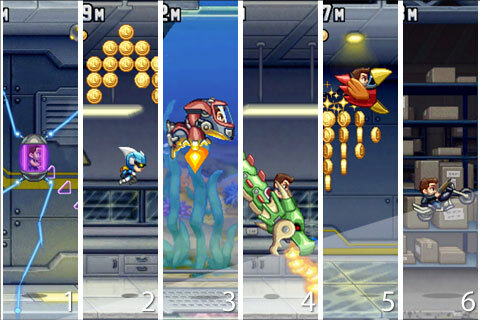 The obvious source of inspiration for me at that time was Jetpack Joyride and its different vehicles. I implemented two new controls and it worked great, I had a winning game idea! 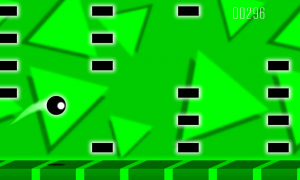 it would be a procedurally generated endless runner with different controls for each of the worlds. I didn’t know (and I still don’t) any other game with these characteristics. I wanted the game to be difficult but the line between difficult and too difficult/unfair is a very thin one. I needed a way to solve the problem of adapting the difficulty to different player skills. Some games have different levels/worlds with different constant difficulties. I didn’t want to do that as I wanted to make it possible to find a challenging difficulty on any world. Other games have opted to do levels with increasing difficulty where you start easy and it gets harder. The problem with that is that when you get more skilled, you need to repeat the “easy” part every time until it gets fun. 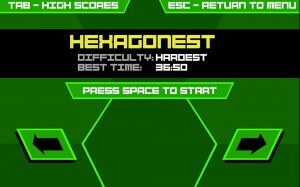 One of my references was Super Hexagon where levels are endless, have increasing difficulty but you can achieve “completion”. That’s how I came up with the 3 + Endless Worlds and scoring mechanism. 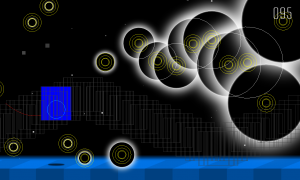 During the development phase I used 3 songs from an artist called TonalReboot that I found on Newgrounds. I discovered Newgrounds (and specially Waterflame songs) when I was looking for a song for Rock Ninja on 2012 and I was amazed by the quality of the artists in that community. I posted on their forums that I was looking for music for my work in progress game and I received a really positive answer from many artists amongst which there were DJVI, Forever Bound and DuttonSaysHi that ended up being part of the game. I’m not sure when I installed Geometry Dash Lite on my phone but it was probably around summer 2014, when it started becoming popular. By that time I had a working prototype, with still lots of things to implement but the basics were there. 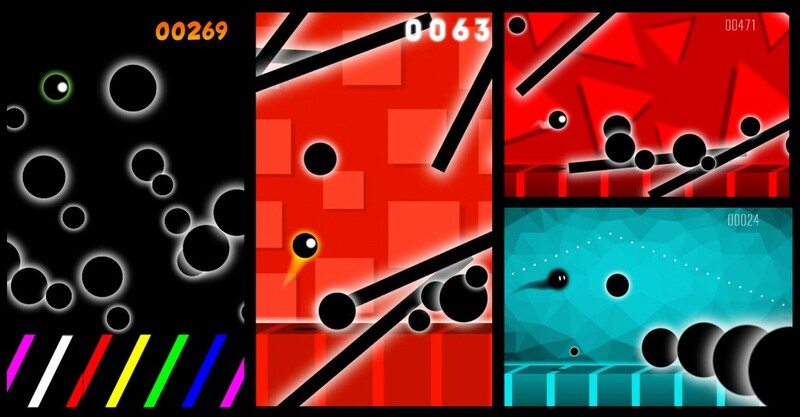 I loved GD visual style and found it extremely well designed, all the pieces seemed to match, the music, UI, the special effects. Even if I could see why it was so popular, I didn’t play much. I passed Stereo Madness, tried a couple more levels and that’s it, that was the last time I played it for fun. 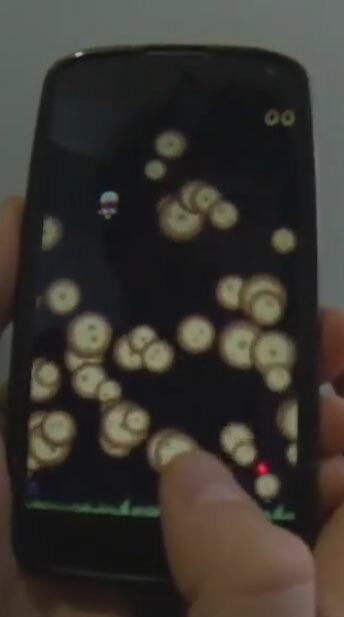 The reason is that don’t enjoy skill games based on memorizing the level. I prefer instead procedurally generated levels where you learn some patterns but you never know what will come next. By that time I didn’t even know there were more vehicles other than the normal and the ship (the ones from Stereo Madness). 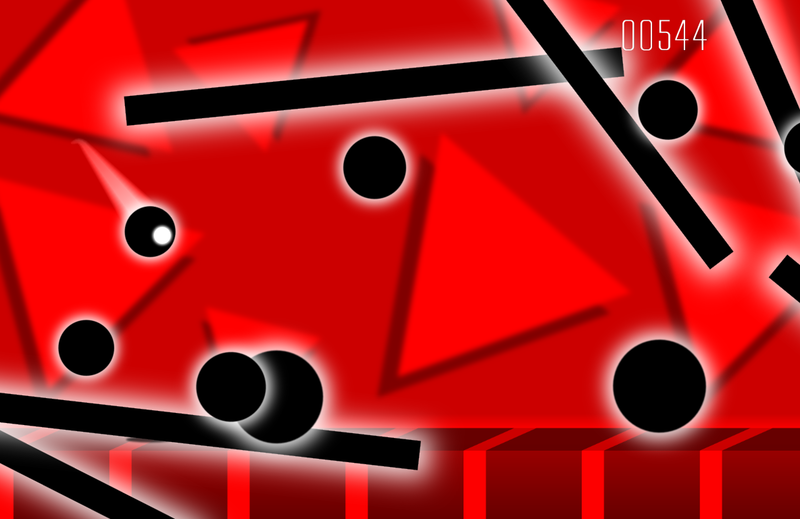 From Geometry Dash I learned how simple shapes could look great with the right colors and about the importance of having the right music. 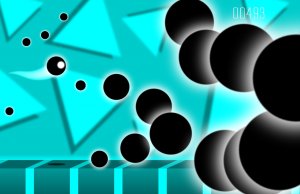 So the last big changes in the game fundamental design were to add different color schemes to the worlds and to replace some of the songs I had previously chosen. And that, my friends, is how Dash till Puff! was born. Today I would like to write about a simple but very important game design concept that is to ensure there is always a way or path. 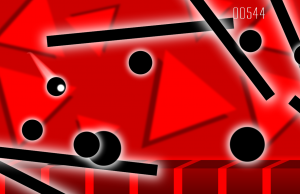 In arcade games, one of the challenges when generating random levels is to get the right difficulty without risking impossible situations (or “No-exit” situation). 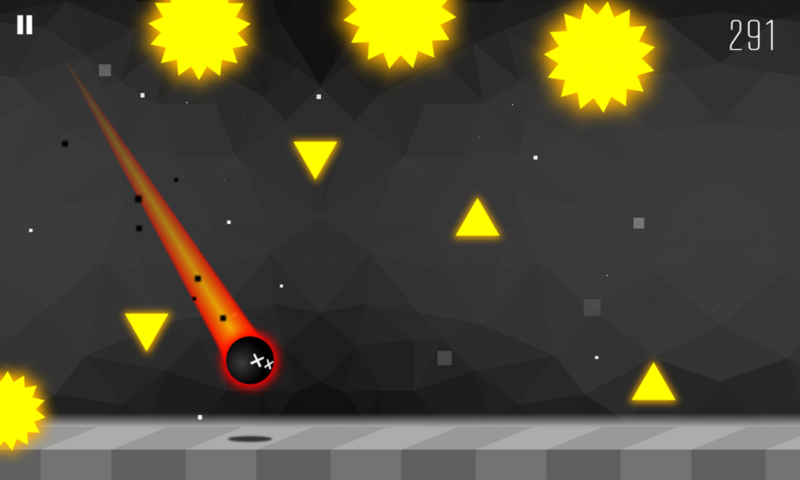 Let’s imagine the game is about a rocket that flies with a constant speed and needs to dodge circles that appear as he moves. Requirements 1. and 2. are easy to implement. 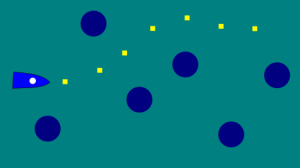 In this case, for example, it would be enough to create new circles on a random Y at a right-offscreen position every X seconds. To make the difficulty progression, X would decrease with time. 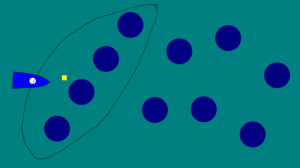 The problem with this approach is that as X gets smaller and the number of circles starts to get larger, the probabilities of a no-exit situation increase. A classic trick to solve this problem is to change the problem itself. Predetermine some hardcoded safe values (frequency in the example) to generate obstacles that for sure will not cause a non-exit situation. This frequency will remain constant through the game. Now, to increase the difficulty, instead of increasing the frequency generating more and more obstacles, just progressively increase the rocket speed. This moves the challenge from geometry path-finding to reaction time. If the first way is not an option, we need to make sure when creating the obstacles that there will be a path. To do that we need 3 things. Generate a random path for the rocket. You don’t need to care about any obstacle, just make sure it moves randomly up and down as the rocket would do. We’ll call this the Safety Path. Define the size for a bounding box for the rocket that we’ll call Safety Area. Imagine the Safety Area follows the safety path. If you were playing the game you should be able to keep the rocket inside the Safety Area. 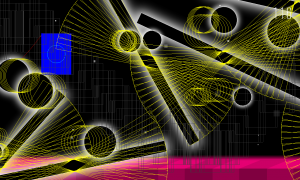 Even if it took some time to create the foundations for this checks, once done it allows us to add any amount and type of objects with randomly generated speed, shape, angular velocity, etc… to our levels without needing to worry about “no-exit” situations. Today I would like to share some screenshots of our work-in-progress new game. Some of the elements you see will stay, some will go and more stuff will be added but the main concept is there. It will be a fast-paced dodge’em-up with several procedurally generated worlds and a different mechanic per world. Next day I’ll post about some of the challenges we faced to ensure there is always a “possible path” and keep the game fair. Hail to the new website!